In my last post, I discussed one of the two main reasons that the author, John Bunyan, divided his novel into two parts. The first reason mentioned was to highlight the benefits to society of individuals pursuing their own happiness. By Christian leaving his family and friends for his pilgrimage to happiness (in this life and the next), he was able to secure the boon of his quest to be used by others. It was this seemingly narcissistic pilgrimage that was anything but narcissistic: Christian drew upon his innate cardinal virtues and the graces of God to secure the gift for future use by his family and neighbors. It was this gift of the correct path to happiness that Christian fought hard to secure for others. The other main reason for the novel to be divided into two parts was to illustrate that eternal happiness can be found along two paths: the path followed by Christian, and the path followed by his wife and children. Christian’s eternal happiness was achieved with the help of Faith and Hope. In fact, both graces are personified in the characters of Faithful and Hopeful. He loses his burden through Faith, enabling him to begin traveling along the road to happiness. He is presented with his “roll” or certificate as encouragement for the travel, with the assistance of Hopeful to fight the many battles to secure the boon and reach the threshold of happiness. It is the love of God at the threshold that welcomes Christian, with his certificate redeemed, to eternal happiness. Christiana and her children achieve eternal happiness primarily through the grace of Charity. It is both the charity towards others that she and her children meet along the pilgrimage as well as the charity shown to her and her children by others that are the hallmark of Part 2. Christiana knew that her husband held the cardinal virtues to find happiness in this life and would surely find the faith and hope to reach happiness in the next life. She had little doubt about her own pilgrimage since she was following in her husband’s own footsteps and would eventually be with him in Heaven. Christian had fought the many battles to secure the gift of the correct path to salvation. The separation of the novel into two parts highlights the roles of the virtues and graces in achieving happiness. The cardinal virtues gave Christian the strength and guidance to find happiness in this life (presentation of the boon) only to be surpassed by happiness in the next life secured with the graces of Faith and Hope. However, it is through the grace of Charity that Christiana and her children find happiness in the next life. The cardinal virtues provide happiness in this life for Christian allowing him to pass along the boon he secured for use by his wife and family. The graces of Faith and Hope aided Christian in finding happiness in this life as well as the surpassing perfection of the next life. It was the grace of Charity alone that allowed Christiana and her children to reach eternal happiness with Christian. There is a reason that this novel has never been out of print for the past 350 years. Its great gift to all readers is the creativity to express achieving happiness in this life and well as happiness in the next life with memorable artistic elegance. This entry was posted in The Pilgrim's Progress and tagged The Pilgrim's Progress on October 17, 2017 by oliver. The second question that must be answered to better appreciate the narrative of the novel is: what is the “roll” or certificate that is given to Christian for safekeeping and that must be surrendered to gain admission to Heaven? This “roll” is given to Christian at the time that his burden is lifted. It is soon lost by Christian only to be found after he is forced to trace his pilgrimage backward to find it. The roll is viewed as the grace of hope: the desire for the difficult but attainable good of eternal happiness. Hope could be considered the nourishment for the Adventure, shielding the traveler from discouragement. The “roll” or certificate is also viewed as the boon or gift that the pilgrim is in search for to attain happiness in this life. The boon is the gift that must be seized before approaching the threshold of happiness. This gift is meant to add to the flourishing of Christian’s family and neighbors. It is captured with the assistance of the virtue of temperance in Gallery Five and through the love expressed in Gallery Six it is surrendered at the moment that Christian realizes happiness. It is this captured boon that helps his family and neighbors to flourish in their lives in Part Two. In the novel, Christian must surrender his certificate before entering the kingdom of Heaven. It is with the grace of hope that Christian is able to reach the gate of happiness. In fact, two important figures help Christian along his pilgrimage once his burden is lost and the “roll” is provided to him: Faithful and Hopeful. Faithful joins him early in his pilgrimage to be put to death later. Hopeful then joins Christian for the remainder of his pilgrimage and joins him in entering Heaven. This entry was posted in The Pilgrim's Progress and tagged The Pilgrim's Progress on October 3, 2017 by oliver. As I mentioned in my previous post, the novel follows the road to happiness as outlined in my book: starting with Gallery Three and progressing to Gallery Seven. The happiness that is sought not only pertains to the after-life, as expected in a religious novel, but also happiness in this life. The first question that must be asked when reading the book, and a question that jumps out of the novel in search of an answer, is the burden carried by Christian in Part One of the book. He carries this burden with him during the beginning of his pilgrimage until he reaches the cross near the middle of Part One. Most readers will agree that the burden represents faith in Christ. Indeed, this is true. It is at this moment that Christian looses the burden on his back that he receives the grace of Faith needed to continue the pilgrimage. However, the moment that Christian loses the burden from his back is also the moment that Christian accepts the call to Adventure found in Gallery Four of my book. Through the virtue of prudence, Christian has known for a while what the future holds for his pilgrimage. It is only recently that he has the courage to accept the adventure that prudence has revealed. It is this virtue of courage, coupled with the virtue of prudence, that frees Christian from his burden. Now he is free to fight the trials to secure the boon that is the hallmark of Gallery Five. This entry was posted in The Pilgrim's Progress and tagged The Pilgrim's Progress on September 26, 2017 by oliver. Up until a few weeks ago, I had thought that I had covered the literature angle of the arts with the two novels, Atlas Shrugged and Brideshead Revisited (the first novel regarding happiness in this life and the second novel regarding happiness in the next life), but I was wrong. I have a third must-read companion book to recommend: The Pilgrim’s Progress, John Bunyan. 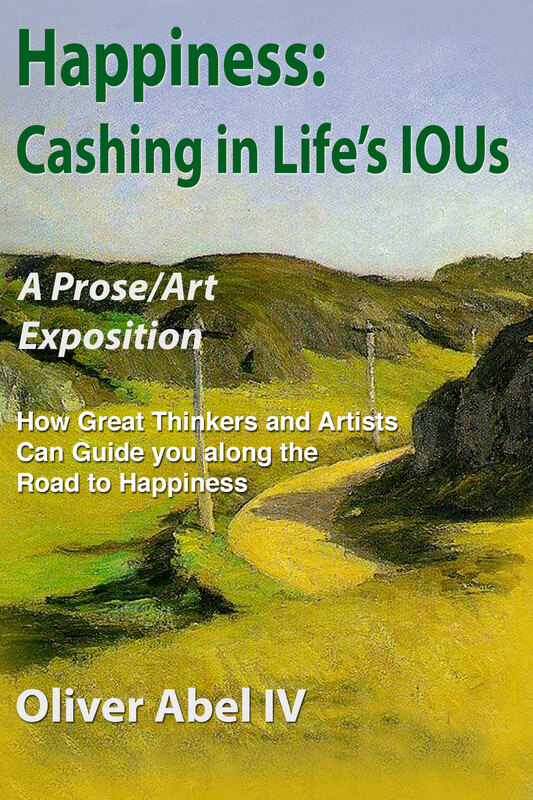 The reason for the addition of this third book is that is entails finding happiness in this life as well as the next life; a feat not easily accomplished in the arts. The main characters, Christian, his wife Christiana and their children, travel the road beginning from the “good life” (the third of seven segments of the road to happiness) to reach happiness not only in this life but the next life as well. The distractions, temptations, and adversities encountered along the pilgrimage as well as the virtues and graces needed to overcome them are well illustrated in this book. It is because of this exhaustive depiction of pilgrims travelling the two roads to happiness, one road seen as a surpassing perfection of the other, that this great work of early English literature is included as the third companion book. More to come about this great book! This entry was posted in The Pilgrim's Progress and tagged The Pilgrim's Progress on September 12, 2017 by oliver.